New Whitley Bay manager Paddy Atkinson pictured while at Blyth Spartans. Whitley Bay have appointed former Blyth Spartans and Newcastle Benfield boss Paddy Atkinson as their new manager. 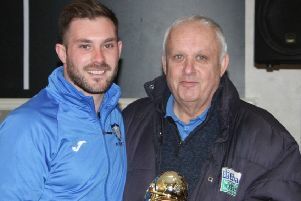 The last two managers, Ian Chandler and Leon Ryan, were both new to the role but this time the club has opted for experience in 44-year-old Atkinson, who guided Newcastle Benfield to the Northern League title in 2009, a season when they also lifted the League Cup. He has also been first team coach at Bedlington Terriers and later moved to Croft Park where he was Blyth Spartans’ assistant manager and then manager. In a lengthy playing career his clubs included Sheffield United, York City, Queen of the South and Newcastle United, where he played for the reserves during the Kevin Keegan era.